I've seen no ads yet... I'm sure I'll catch one soon! Yeah, after moaning that my Mclaren/Jenson tee-shirt hadnt come, not it has, so now im well excited! Did you see the Twitter campaign thing they had to find one? Was a WELL good idea! 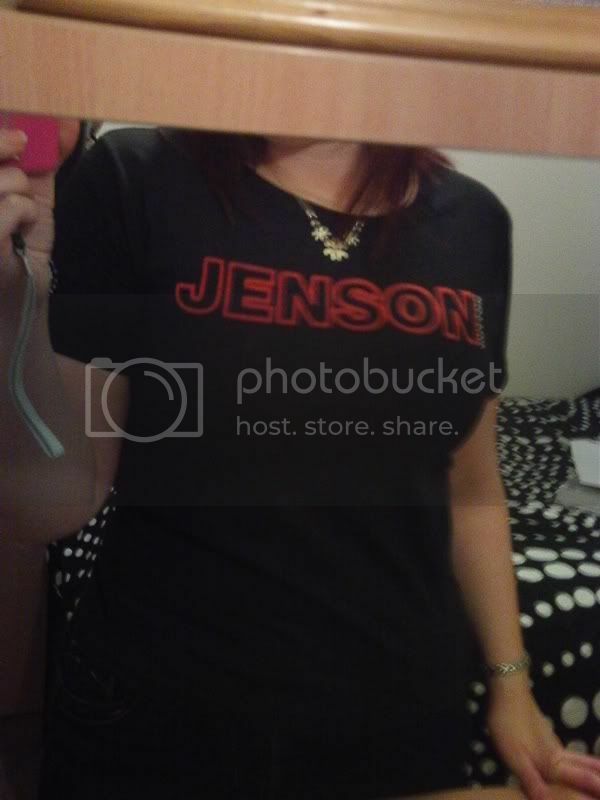 Jenson top came today I am now officially ready for the 2010 season! Some of them where properly nice, aren't they putting the winner into production? Yeah, some of the entries were amazing!! Can't wait to see the final three actually designed..
For those who are interested the F1 teams are still testing at our grounds today. Haven't got a scooby doo what they're doing but they're making a (nice) racket. Can anyone clear up the exact rules? I thought they could only test on the official days but obviously not. They also tested during the season in the autumn. I don't know if they were done on GP2 tyres or not but they were 100% F1 cars. I dont think they will be testing. They can only test on allocated days, and throughout the season they can complete a few striaght line tests, they can let a reserve driver test if he is going to race, and hasn't drove for two years, and they have limited mileage to film TV commercials. If you are so insistent on them still running, they they will probably be filming for TV, but when they do film. And with the amount of F1 sites i read, so often, and with them reporting on every minute of the testing, tv filming or whatever, i havnt read anything, so its pretty unlikely its any. You should take pictures/video and post it to every F1 reporter in the country who is itching to claim the next scoop and you could be the beginning of the new 'testgate' scandal! Remember to post on here first though as we on TSR did give you the low down and you know, we are awaiting the next scoop! I would love to have your view of Catalunya circuit! Yes, hopefully it is Fezza and in particular Alonso. He seems to be involved in all the gates. Obviously not casting any aspersions here or anything...! He does seem to be around a lot of gates ... but yes, I think they're due one now! TBH it's not for the benefit of the F1 cars it's more for the new road cars that get tested here and they don't want any details leaked. It's seems to be common inside knowledge that they do extra testing though because it's not just one or 2 cars but pretty much all the teams (at least from what I've seen). I'm not convinced any rules have been broken and they've probably found a loophole. I know this year the rules have changed so that they can test on non championship tracks with drivers who've had 2 races or less. I'm trying to find out from the guys here what the exact rules are and if we're aiding the teams in breaking them. Kubica got it spot on! This kubica who isnt in the video?